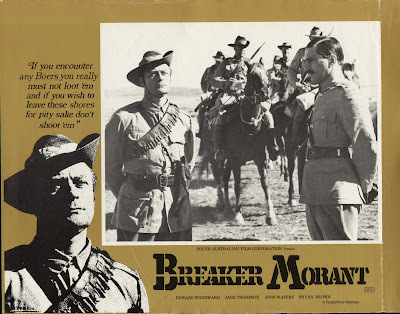 Sadly just over a week since I praised the virtues of Breaker Morant and it's star Edward Woodward, news has come in announcing his passing. Star of many movies and television shows, notably Morant and The Wicker Man, Wodward slipped away from us last night due to a "number of illnesses including pneumonia". Such a shame that one so talented, and such a powerhouse on the screen, should go so quietly, but then he earned that right. There was a funny side to Woodward's intensity though. At the same time that he made Morant he also appeared in a series of commercials for a South Australian company called Craftwood, who are now long gone. The ads showed a deadly serious Woodward explaining the benefits of the product and had the punchline of, "Who would? Craftwood would, or my name isn't Edward Woodward." I always found that amusing, his delivery was spot on and I always wondered if he didn't crack up as soon as the word "Cut" was yelled.